We are excited to announce we will jetting off on our annual summer trip to Amsterdam this month to visit our partnering company IAA. Amsterdam is a city full of interesting sites and amazing buildings to explore and below are a few exciting new buildings and places on our itinerary. Renovation of the Rijksmuseum – Last year Spanish architects Cruz Y Ortiz completed the second phase of a whopping 11 year refurbishment of the famous Rijksmuseum. A new double-height atrium with a glass roof has been built allowing light into the space below. The Eye, Film Museum – Completed by Delugan Meissl in 2012 the museum is situated in the privileged riverside area in the heart of Amsterdam, the Film Institute represents the visual landmark of the new Amsterdam Noord quarter. 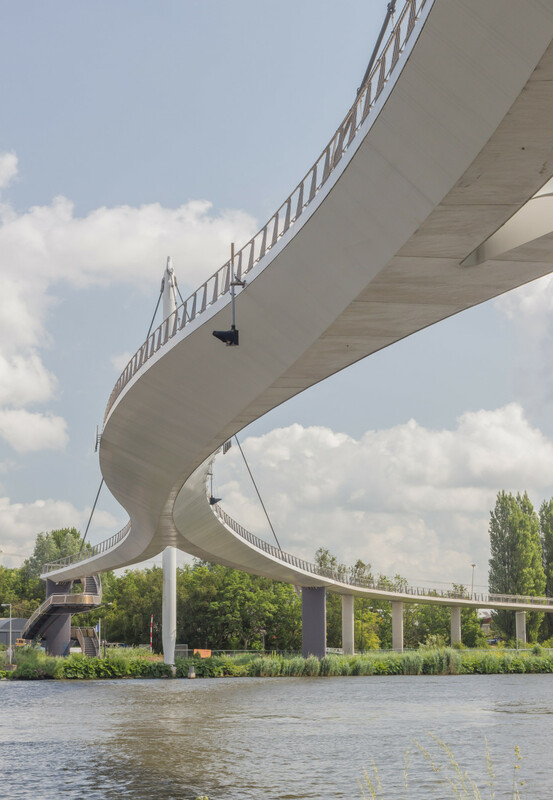 Nescio Bridge – Designed by Wilkinson Eyre, the Nescio Bridge is currently the longest cycle bridge in the Netherlands completed in 2006. With a span of 163.5m over the Rhine, it is the longest one cable suspension bridge in the Netherlands. The bridge has a 10m clearance so ships can pass beneath it with approaches either side making it in total 779m long, nearly half a mile! Faralda Crane Hotel (IAA) – For those not afraid of heights, IAA have designed the second Crane Hotel in Holland. The hotel comprises 3 luxury suites within the cranes structure on the canal side complete with a hot tub. ROC Het Sierraad (IAA) – The Jewel is a Community College, a multi-purpose centre for the community in which different educational and social functions are housed. Refurbished and restored by IAA, the striking listed building dating from the 1920s is located on Postjesweg in the Baarsjes, an up-and-coming neighbourhood of Amsterdam. VU University Medical Centre (IAA) – The VU University Medical Centre is a university hospital. In addition to patient care, the building also undertakes scientific research and medical training on site. The new complex is the largest emergency department in the Netherlands, spread over 33,000 m2. Almere – This innovative experiment is a large scale self-build project on a 100 hectare space (250 acre). The land was reclaimed from the sea in the 1950’s and the entire area has been master planned by the local authority into a number of districts. Each of which has around 720 self build plots and by early 2012 around 1000 homes had been built; eventually 3,000 self-build homes are planned. Borneo Sporenburg Tour – Constructed in the late 1990’s Borneo Sporenburg in the Eastern docklands of Amsterdam is one of the most original housing initiatives commissioned by a city and financed by a national government. The two peninsulas surrounded by harbour landscapes and canals were transformed into a high-density area filled with 2500 dwellings inspired by Dutch architectural heritage and small village streets. We are excited to be exploring this area with a guided tour from a local urbanist from IAA. Grand Depart – Just outside of Amsterdam lies Utrecht. During our visit the Grand Depart of the 2015 Tour de France will start with a time trial around the city. Utrecht has transformed itself to accommodate and celebrate this unique event, and we are looking forward to getting involved.